The cilantro-lime flavored chickpea filling. You may not believe your eyes when you read the end of this sentence, but all week I have been daydreaming about eating kale. Yes, it’s true. I admit it. I’ve thought about putting it in soups, making salads with it, and adding it to wraps. I craved kale’s distinct flavor. It is slightly bitter, yet it also reminds me of the familiar taste of raw broccoli. I’ve had a bunch of curly green kale in my fridge since Sunday and I have practically been counting down the seconds until I could use it. For some of you, this may be a feeling you can’t relate to. I don’t think many people dream about eating kale, but if you’ve become a kale-addict as I have, then this feeling wouldn’t seem too far fetched. 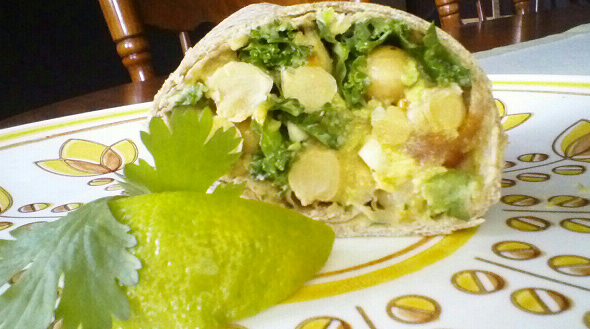 This crisp leafy greens were nestled in between layers of the cilantro-lime chickpea wrap I made for dinner. While kale didn’t play a starring role, its crisp texture paired well with the creamy feel of the chickpea salad. At first bite, the flavors of lime, garlic, and cilantro mingled on my tongue. In two words, for me, this salad was simply perfection. It was just what I wanted at the time, a healthy meal that didn’t sacrifice any flavor. On top of all that, it was also pretty inexpensive to make, which my wallet is still thanking me for. 1- Drain and rinse the can of garbanzo beans. 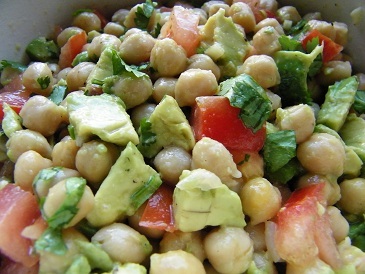 Add them to a bowl with the diced tomato, avocado, cilantro, and garlic. Then add the juice of one lime, the olive oil, and seasonings. Stir well. Add more salt or pepper depending. You could just eat this salad like this or add it to a wrap. It was very tasty on its own, but as I mentioned before, I had my sights set on eating kale. For my expert wrap-wrapping technique read on. 2- I am no expert, but this method works. Lay your wrap flat and spread it with a layer of hummus (spread it all over the wrap as it acts like a glue keeping the wrap together). Then place the kale and chickpea salad on the right half of the wrap (leaving about 1 1/2 inches of space above and below where the kale and salad is). Then fold the top and bottom edges of the wrap in towards the center and begin to roll the filled side of the wrap towards the empty side, rolling it tightly as you go. Slice and serve! Have you been daydreaming about eating any specific foods lately? This looks DELICIOUS; lime & cilantro is such an amazing combination. Agreed – you just can’t go wrong with that combination! Yes! Really good combo! I’m loving this recipe. We do bowls a lot. It would be a good addition to our regular rotation! 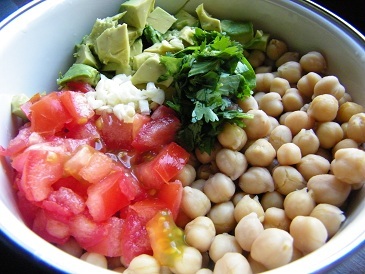 Bowls are a genius idea – so simple yet tasty. Definitely try it. It was delicious! Girl, you aren’t alone in your kale daydreams. I actually interviewed someone recently who even asked if it would count as a favorite herb (as in herbal medicine) due to its awesome nutrition content. I concur, and add delicious! I’m glad I’m not alone in my adoration of kale. I love cooking for people, so if I could I would be there in a flash 🙂 I hope all is well with you and your week finishes smoother than it started. Thanks Samantha. I think it’ll be better after today. Fingers crossed. We actually had one of your recipes tonight, the quinoa with mushrooms and greens – hit the spot. Thinking about featuring it as my Weekly Pin next week – linking back to your recipe of course. You okay with that? I’m so flattered that you’re pinning it 🙂 I’ll have to find you on Pinterest. I’m sure you’ve pinned tons of delicious recipes! You can find me as Anna Tulou Orr – I’d love to check out your boards!